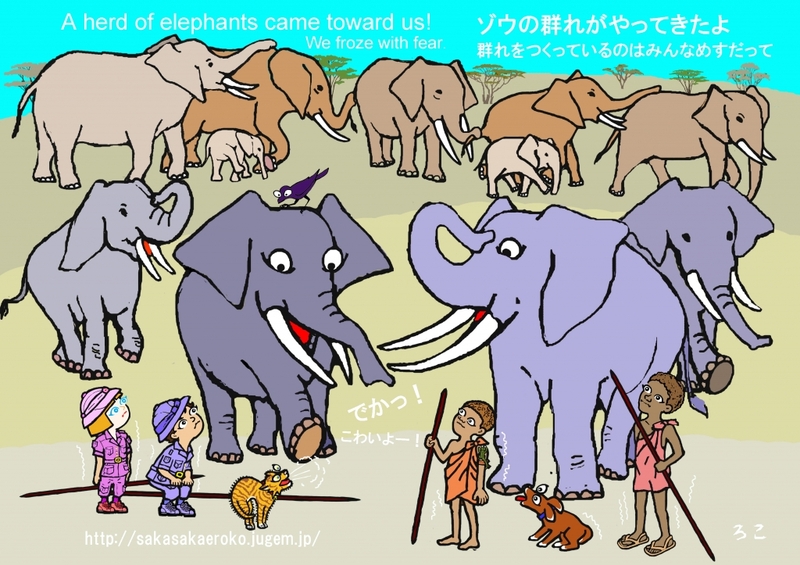 ゾウの群れに出会ったよ。We met up a herd of elephants. Hi everyone, are you all fine? We met up to a herd of elephants. African elephanst are huge cleatures. The average weight is about 6 tons for males, about 3 tons for females, and about 150kg for newbone babies. Only females and their cubs make the herd. When a male cub becomes around 12 years old, he leaves the herd. The eldest grandma elephant takes the lead and guides the herd to places with grass and water places. Babies and cubs were well protected in the whole herd. the newbone was sometimes unable to control his four legs and let them tangle. It was cute. We went to grazing for sheep. Early in the morning, adult men put the cattle out to pasture. Then, elder boys come to grazing for calves. 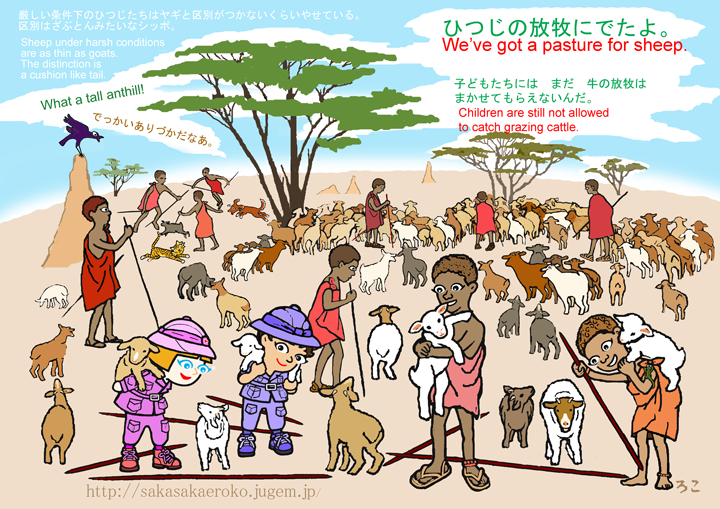 Finally, we children got a pasture for sheep. When one sheep runs on the whim, in an instant, others follow it. We had to strain to oversee them. It was a hard work, but we had a great time. 2018 Merry Christmas! and 2019 Happy New Year! Taro's dad and mom came back to Japan. Taro's dad is a zoologist and mom is a botanist. They studied in tropical jungles for three years. Taro was only two years old, when his parents left Japan. 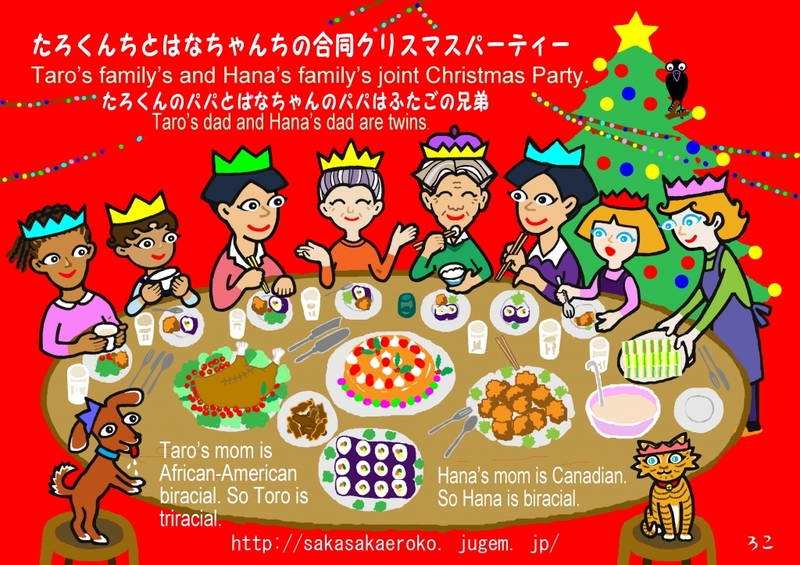 Therefore Taro was brought up by his grandparents. They will enjoy a Merry Christmas and a Happy New Year with full members this time. 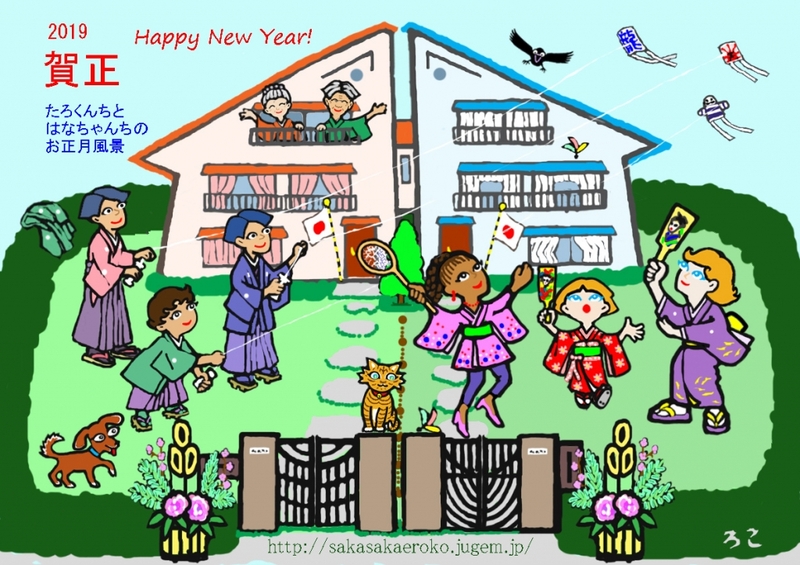 I wish you a Merry Christmas and a Happy New Year, too! Maasai warriors showed us their jumping dance. "Warriors" means a group of late teenaged young boys who got circumcisions at the same time. 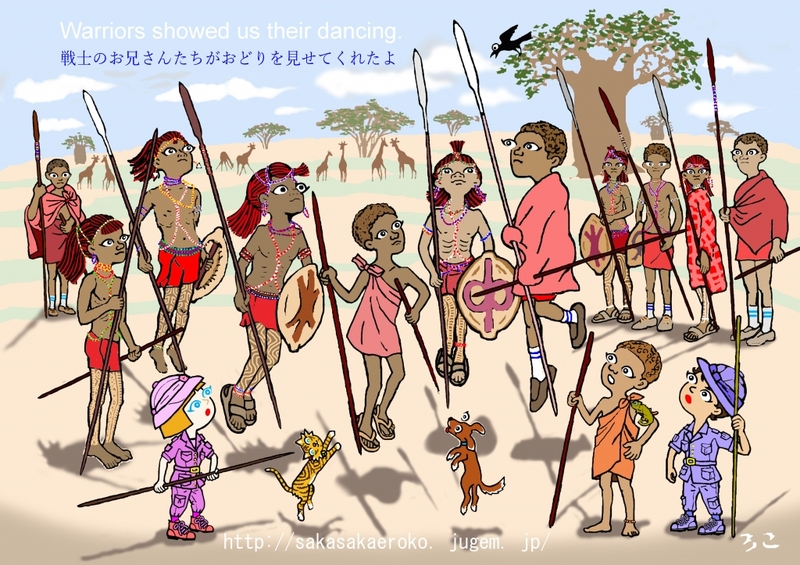 They defend their village (a big family's enclosure) against cattle burglars or big cats like lions or cheetahs. Some of them had their hair done in their traditional style with red clay and grease. At first, I thought they were wearing wigs but actually they were their own hair, but school boys such as high school or college students don't do that. They could jump pretty high. We enjoyed their dance very much. The earthquake, the day before yesterday, gave us a real scare. We’d like to express our concern for the people in the stricken area. Fortunately there were no damages around Grandma Roko side. This time she replied them in the card. 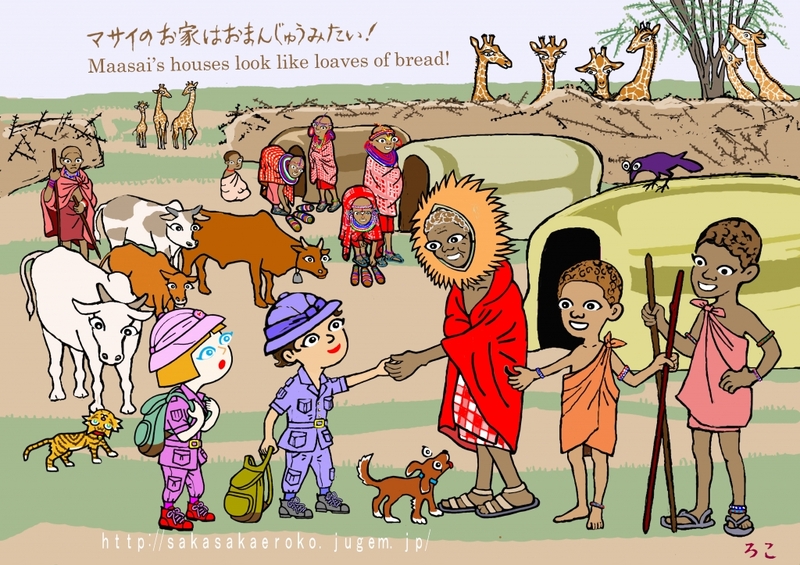 We visited a Maasai's village. The villagers wore their traditional outfits. We were momentarily under the illusion that we were in the time centuries ago. Their houses looked like loaves of bread. They were made of branches and cow dung, but didn't smell bad. It smelled like the sunshine because cows ate only grass in savannah under the sun. We made toy cars with wires which were given by a nearby motor repair shop. SuddenlY a guinea fowl appears from the bush. Peter's grndma said it was delicious but it's banned now. I wish I could eat it. How was your New Year's Day? We enjoyed races with Mt. Kilimanjaro for a background. Mt. Kilimanjaro is 5895m high. It's the highest mountain in Africa. It's covered with perpetual snow all year round. I think Mt. Kilimanjaro looks like Mt. Fuji but KamonPochi said it doesn't. Anyway Mt. 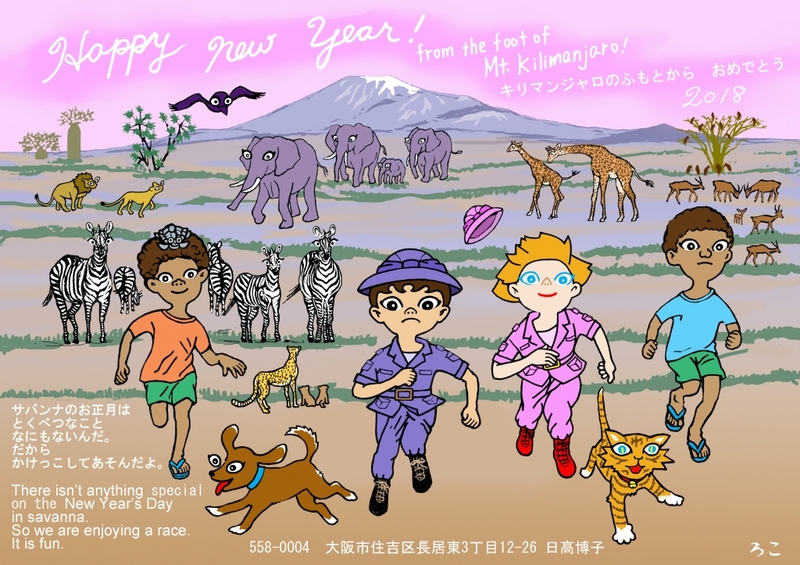 Kilimanjaro is as beautiful mountain as Mt. Fuji. Make the year 2018 good for you. We might have White Christmas in many places in Janan this year. 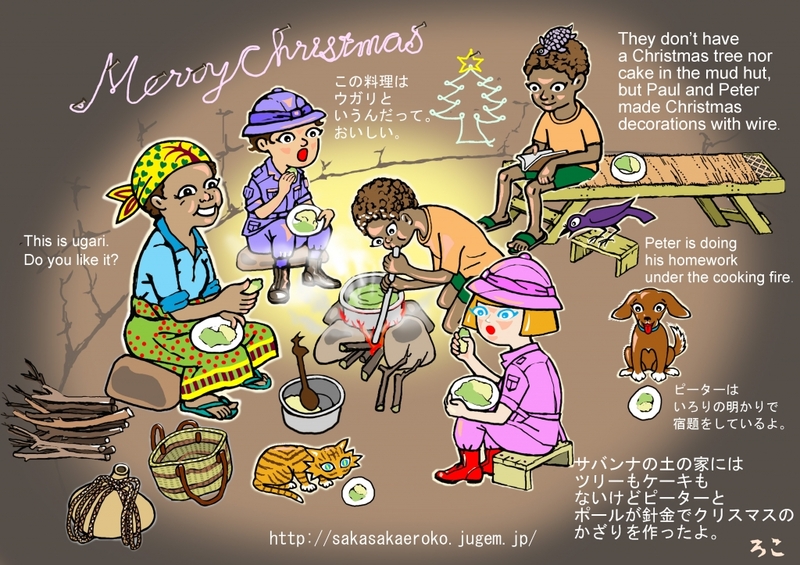 In savanna, they don't have Christmas trees nor cake, but they go to church and pray devoutly. Grandma Roko's new book is just about finished. It took more than three years. 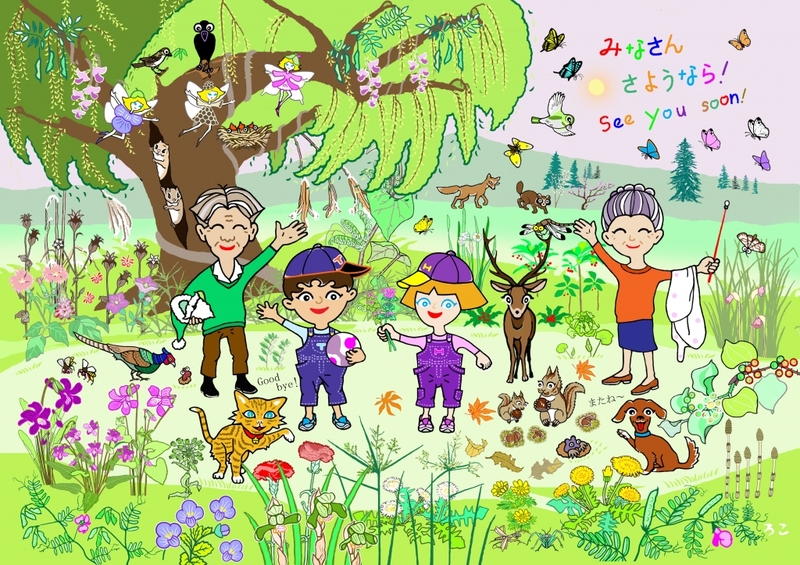 The title will be ''KamonPochi and his fun friends In the Fairy Garden". 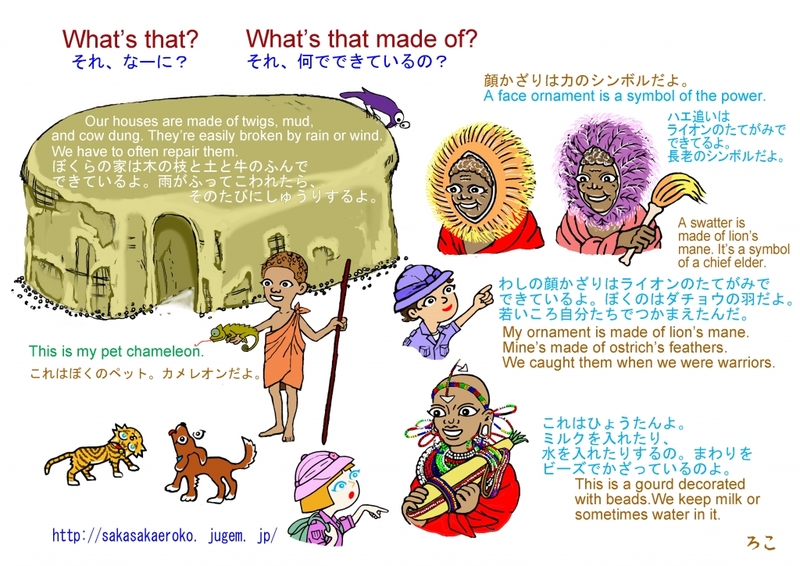 This illustrtion is the last page of it. You will be able to see it soon.